Jones Natural Chews is a proud sponsor of Life With Beagle and Lulu's Favorite Things, our annual fundraising campaign for Harbor House of Central Florida. Although we received compensation for the post, my opinions are my own -- and so are Lulu's. It's in the air: a slight (very slight, this is Florida) chill, leaves are changing (a little, kind of, on some trees), that sudden desire for warm drinks and pumpkin bread. And everything is feeling just a bit spookier outside. We want to help your pup get into the spooky mood too. We love Jones Natural Chews! They're all natural, made in the USA, safe treats for your dog to eat. The Boo Bucket is a great, Halloween-themed variety pack for your dogs. The bucket has nine items in it and is reuseable: a Windee, 2 Lambly Links, 2 Woofers, a beef Knee Cap, a beef hoof, an "other pig ear" (a piece of pig chin) and a bacon roll. They're all full size pieces too. Jones Natural Chews is a family-owned company out of Illinois. They take animal parts that dogs love to chew on, but humans probably won't eat, and they render them naturally as dog treats. They also bake their bones so they are ok for dogs to eat! And some of these treats are more than treats, they can be good for dogs. For instance, the Windee (beef trachea), is a natural source of glucosamine and chondroitin, which is great for dogs who need help keeping their joints healthy. Knee caps, meanwhile, are great for medium size dogs who are serious chewers. They don't splinter or break up. They get smaller upon gnawing. And they are good for natural teeth cleaning. Others are just great treats to give dogs once in a while that last longer than a regular cookie -- like the hoof, which can last for weeks if allowed. There isn't a treat Lulu doesn't love, but she absolutely LOVES Jones chews. Jasmine does too. You can find Jones Natural Chews online, or at boutique stores all over the country. Jones has a store locator on its website. Check it out! And you can get a Boo Bucket if you enter our flash giveaway right now! The giveaway lasts until October 15. 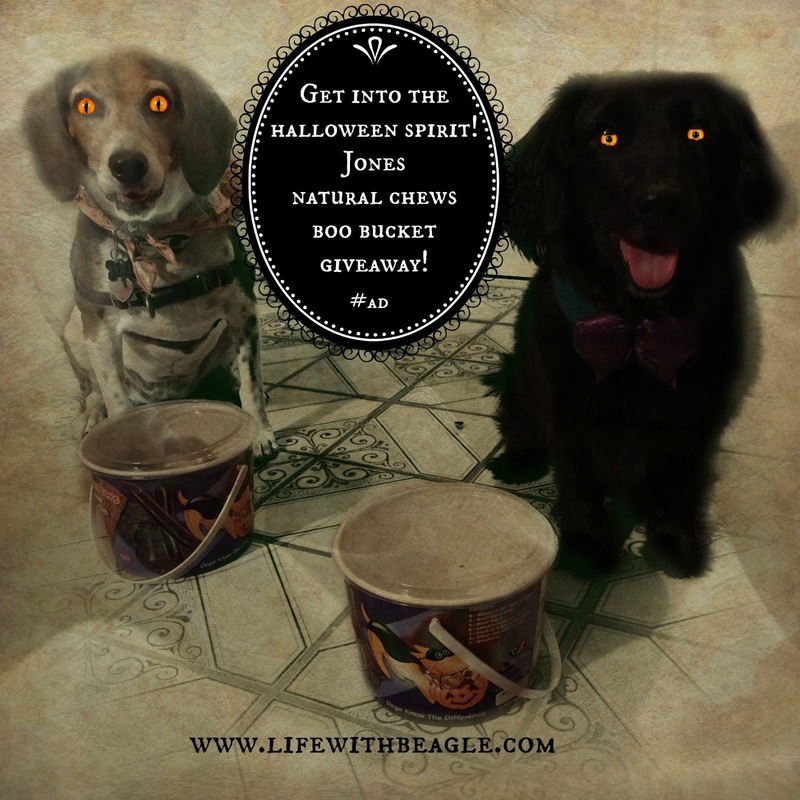 We are giving away 1 Boo Bucket. Just enter using the Rafflecopter and following the instructions. Only US entries, unfortunately, sorry. Good luck! They'll be hanging out in the back room away from the front door so as not to scare the kids! Chewing on the mail person! my dog doesn't have any plans this year. The dog will probably go a little crazy with the doorbells. We will go trick or treating at Treats Unleashed our dog bakery. Artie is going to be spaghetti and meatballs for Halloween this year. My wife made the costume for the pet parade at the nursing home a few weeks ago. Artie took first place in the costume contest. my dog will be dressed up in a skeleton costume! Thor will be going nuts every time the doorbell rings. we will go to all our dog neighbors house and trick or treat for dog treats! Prudence is looking forward to the "Howloween" pawty at the Barker Lounge! This year she's going as a "fisherman"! Banx Suggs will be sporting his shark costume and watching Hocus Pocus!! Our Waffos ' birthday is the 13 of October that is when we celebrate his Halloween themed birthdays. He loves to play with plastic cauldrons & we usually get him a pinata filled with some treats & toys for him. Thank-you .